What do you understand by the term SAP FICO? 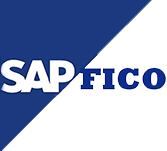 The concept of SAP FICO is divided into two concepts, SAP FI and SAP CO. SAP FI represents the Financial Accounting Module of SAP ERP, which is used for the storing the financial data of the organization and analyze the financial condition of a company. SAP also facilitates in integrating FI with other modules like SAP SD, SAP PP, SAP MM, SAP SCM, etc. The other concept is SAP Controlling (CO), which enables in coordinating, monitoring and optimization of the processes in the organization. The master data covering the cost and profit centres is managed and configured by SAP CO. The tutorial mainly covers the basic concepts of SAP FICO and its various modules and sub-modules. What are the prerequisites required and who are the audience for learning the concept of SAP FICO? Good knowledge and understanding of the financial dealing of a business or an organization. Knowledge and exposure on accounting, costing and financial data are also required to better understand the concept of SAP FICO. This tutorial is mainly targeted for the professionals who want to learn the concepts and ropes of SAP FICO and implement in practice. The concept is mainly helpful for the consultants who implement Financial Accounting and Cost Accounting with SAP ERP Financials.